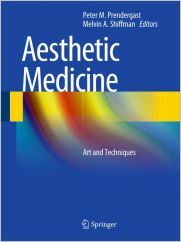 The Aesthetic Medicine: Art and Techniques provides step-by-step instructions in the procedures and techniques commonly employed in aesthetic medicine. The book is divided into four parts, the first two of which offer an introduction to aesthetic medicine and discuss preoperative assessment and treatment. Detailed guidance is then given on a wide range of cutaneous procedures, including the use of botulinum toxins, dermabrasion and microdermabrasion, cryotherapy, chemical peel skin resurfacing, laser treatments, mesotherapy, sclerotherapy, capacitive radiofrequency treatment, and the use of dermarollers. The final part of the book is devoted to techniques employed in shaping the face and body, such as breast and facial augmentation, penile enhancement, liposuction, and management of hair loss or excess hair. All procedures are depicted with the aid of numerous high-quality illustrations and color photographs. This book will serve as an excellent guide for both beginners and experienced practitioners.